In spring 2017, the 7th Tallinn Applied Art Triennial will once again invite applied arts and design professionals and fans to Estonia. The topic of the Triennial, taking place from the 21st of April until the 23rd of July, is “Ajavahe. Time Difference”, encompassing time and the different ways of perceiving it. The curatorial team of the Triennial asks artists and designers to explore whether people really are overwhelmed by the apparent overabundance of information and how they deal with it, how they perceive time and deal with extremely fast-paced life. To allow participants more time, the deadline of the open call for artists and designers to participate in the Main Exhibition of the Triennial has been extended from September 30th to 10th October 10th, 2016. According to Merle Kasonen, the chairwoman of the Triennial, extensive time expenditure and the meaningful use of it is definitely one of the features that binds together various fields of applied art. “The current point in time seems to be a crossroad of two world views. Fast fashion and other types of fast consumption are starting to seem outdated – at least in the eyes of the responsible persons trying to see the bigger picture – and people are looking for new paths and directions. Both slowness (falling behind) and speed (extreme superficiality) have acquired equally negative connotations. At the same time, the sense of time is subjective – and this is what we invite artists and designers to explore,” Kasonen explains. Until October 10th, the open call for the Main Exhibition of the Triennial is open to individuals and groups from all fields of applied art and design. Works in both digital and physical form, dealing with topics relating to time, tempo, different notions of time, and approaches to time are welcome. More information about the open call of the Main Exhibition can be found here. Works can be submitted digitally via Defolio. 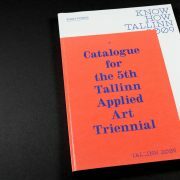 Tallinn Applied Art Triennial is an international art event established in 1979. The goal of the Triennial is to offer new, topical and unexpected focus, which will serve to help examine contemporary applied art and design practices on as broad scale as possible. Every Triennial has new format and theme, but it has always been centered around the main exhibition with additional events and happenings supporting and explaining its main topic. 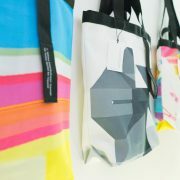 The triennial is organized by NGO Tallinn Applied Art Triennial Society.